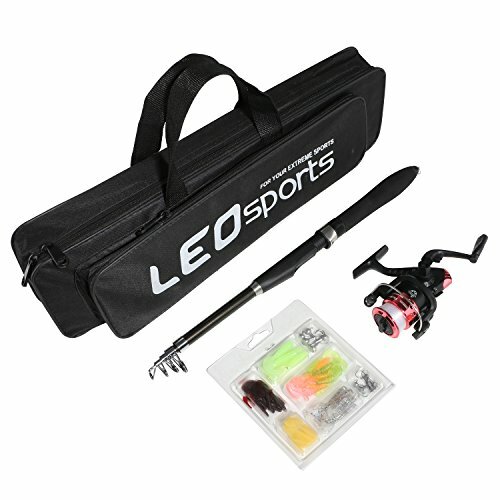 This fishing gear set is compact and easy to carry, the fishing pen rods and reel travel kit has everything you need for casual fishing while camping and hiking. The kit include Pen Rod and Reel, Fishing Line, Fishing Lures, Fishing Hooks, Fishing Bag, well-equipped fishing tool. Package includes about42 pieces soft lures and 10 jig head hooks of small size. PERFECT SET: This fishing kit is special made for novice, including necessary accessories for fishing: Fishing Rod+ Fishing Reel+ Fishing Baits+ Fishing Hooks+ Fishing Bag. FISHING ROD: Telescopic, the length is between 17.7 to 19.7 inches. Made of ant-rust mental material and ABS plastic, glass fiber, hard EVA handle, durable and sturdy to use. FISHING REEL: With fishing line, folding crank and anti-slip handle, convenient and give your good experience. FISHING BAITS AND HOOKS: It contains 6 kinds of soft baits and 10pcs of fishing hooks, well-equipped. If you have any questions about this product by BlueStraw, contact us by completing and submitting the form below. If you are looking for a specif part number, please include it with your message.